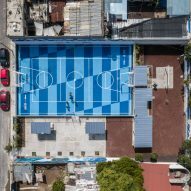 Mexican design studio All Arquitectura has created a vibrant football and basketball court for one of the poorest and most violent areas of Mexico City. 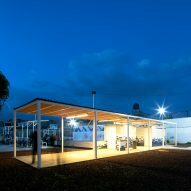 All Arquitectura upgraded the La Doce venue in collaboration with Love.fútbol, a non-profit organisation that restores and regenerates sports fields in marginalised areas of cities around the world. 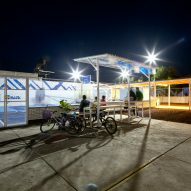 This project aimed to enhance facilities for residents of Valle de Chalco, on the eastern outskirts of the Mexican capital's vast metropolitan area. 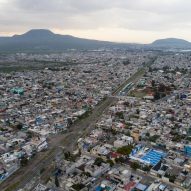 The neighbourhood – together with Ciudad Nezahualcoyotl and Ixtapaluca – form the world's largest mega-slum. 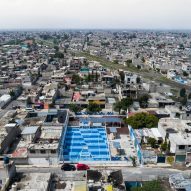 "The project is located in the municipality of Valle de Chalco, returning to the community a living space located in one of the areas with the highest marginality and with one of the highest rates of violence at the outskirts of Mexico City," said the studio. 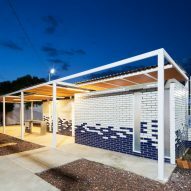 Helped by sponsorship from UK football team Manchester City, All Arquitectura refreshed the run-down venue to create a social space for the community to use. The most noticeable change is the surface of the sports court, which is covered with stretched and slanted chequerboard pattern, coloured two bright shades of blue. Markings and equipment allow the field – measuring 49 by 82 feet (15 by 25 metres) – to be used for football, basketball and other activities. 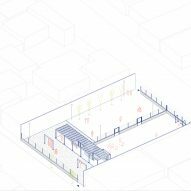 Bleacher-style seating is located to one side for spectators, sheltered by metal canopies. A vibrant mural runs the length of the site behind the seats. 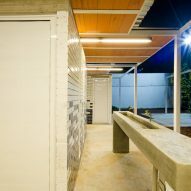 At one end of the 10,419-square-foot (968-square-metre) site, a pavilion is placed on a concrete platform leftover from the original venue. 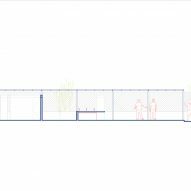 The new building houses an administrative area, restrooms, and storage space, with room for educational and communal gatherings. 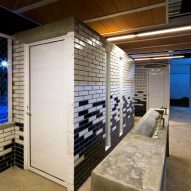 Behind, a pebbled courtyard features gym equipment like pull-up bars and punch bags for outdoor exercising. 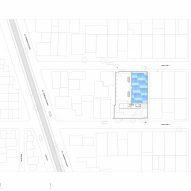 Overall, the refreshed court adds colour and atmosphere to the surrounding run-down streets, which are filled with apartment shacks and deteriorating buildings. 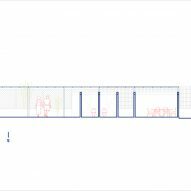 "The project is based on a network and a proposal for change that arises from the need to develop quality public spaces in marginalised areas in various cities around the world," said All Arquitectura. In cities around the world, bold hues have been added to sports courts to regenerate neighbourhoods or simply act as art installations. Examples can be found in Paris, New York, St Louis, and the Belgian town of Aalst. Photographer Ward Roberts has spent years capturing colourful courts across the globe, which he then presents as muted pastel tone in his images. Photography is by Zaickz Moz.